I did three repeats of the 16 row cable (Eunny's sock leg was four repeats. How on earth could I even think I could pull off only knitting three?) before I decided it was time to do something else. A heel for instance. After turning it I was however slightly surprised to see that the leg has shrunk quite a bit. Must be the heel pulling it down. I was a bit disappointed, but then I figured the only reason for a longer leg would be to show off those foxy cables, and there's still plenty of room for that. Sock leg length has a saturation point, a trade-off between the need for warmth and the reluctance of continuing to knit the same thing you've been knitting for days now. My back is aching/ from all sock-making. I was a bit anxious about gauge, since it seems that no matter how thin the yarn and itsy bitsy needles I can never get over 28/10, but I've pulled it over my heel and despite the mind-boggling 96 stitches per round I think it's gonna be nice and snug. As I started the sock I was worried about 1) not wanting to keep working on Salina and 2) not being able to keep interest in these socks until finished. I feel a kind of stress within, wanting to finish things and not wanting to knit things that don't get finished. I'm stressed out about the things I've started, and about the things I've promised people I'll knit for them. These socks are however, and today, still kind of fun, despite the number of stitches mentioned above and the never "just knitting along" as there are things going on on each row. Today I'm going to try to keep away from the sock for a few hours, do the dishes and go to look at a sofa bed. This week has been interesting; I've found an apartment I'd love to live in (I think) and finally solved all the financial issues and am hence good to go bid on it. And I even think I have a good shot of getting it! To keep myself from going crazy with anticipation until seeing it properly on Monday I think I'm going to a funiture store and dream away. I got my second SP10 parcel the other day - and it's just as good as the last one! There were glass beads and flower-shaped beads, a knitted brooch that will be that little extra on my brown tweed jacket (if global warming ever lets me wear it again) and a "some assembly required" brooch. There was a cherry infusion that makes great ice tea, and there were yarn. This heavenly person has got me three balls of Bamboo Soft from Rowan, one extra ball of Felted Tweed for my Salina (I'm still on the first sleeve, but back and front are done) and two cones of Tsumugi from Habu Textiles, and a bunch of patterns from the web as inspiration... I'm knocked off my feet, as usual. Beautiful, all of it. All the things I get from my secret pal are both high-class and always right up my alley. SP, you're a dream! And I must say the card with a knitted Union Jack is just super cute. It's art! I'm putting it up on my wall. But you didn't knit that yourself, did you? 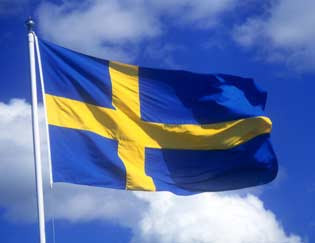 Today is the national day of Sweden. We've celebrated this day since 1983, and since 2005 it's a national holiday. In 1523 Gustav Vasa was elected King of Sweden on this day, and many other things of importance for Sweden has happened this day. For example, Queen Kristina abdicated in Uppsala on this day in 1654, and in 1974 we got our current instrument of government, which is one of the best reasons to celebrate this day. Its first paragraph states that all public power in Sweden starts from the people - isn't that beautiful? Today I'll be extra thankful over being Swedish, living in not just a beautiful country with amazing nature, from the alps to the archipelago, but also in one of the world's strongest democracies where gender equality has come far and even idiots are allowed to speak their minds publicly. A cute little purse, perfect for keys, cash, cards, cell and lipgloss. All you need for a night out. Don't know how carrying a knitted purse affects my chances of getting lucky. Can't get any worse though.